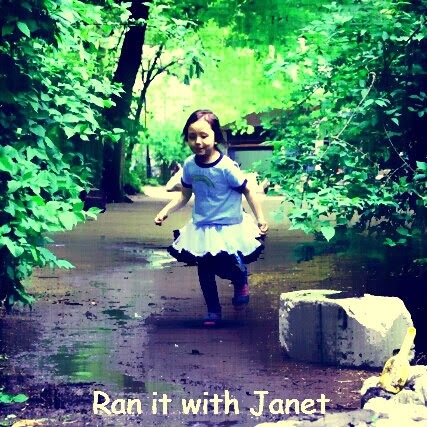 Ran It With Janet: GET READY!! LAST MINUTE INFO ON THE BIG DAY JUNE 4 AT 6:30AM! GET READY!! LAST MINUTE INFO ON THE BIG DAY JUNE 4 AT 6:30AM! 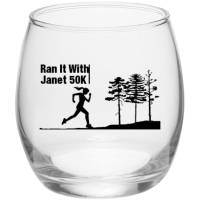 The Ran It With Janet 50K is on National Trails Day, -- Saturday, June 4, 2016 we're going to have a splendid run out at Manassas National Battlefield! This far out the weather hasn't yet stabilized, but there is a good chance it'll be mostly dry and sunny until thunderstorms in the afternoon.... Remember, This year, we will be starting at the Brownsville Picnic Area, located on the far west end of the park off of Groveton Road. Do not show up at Stone House where the event was at last year. 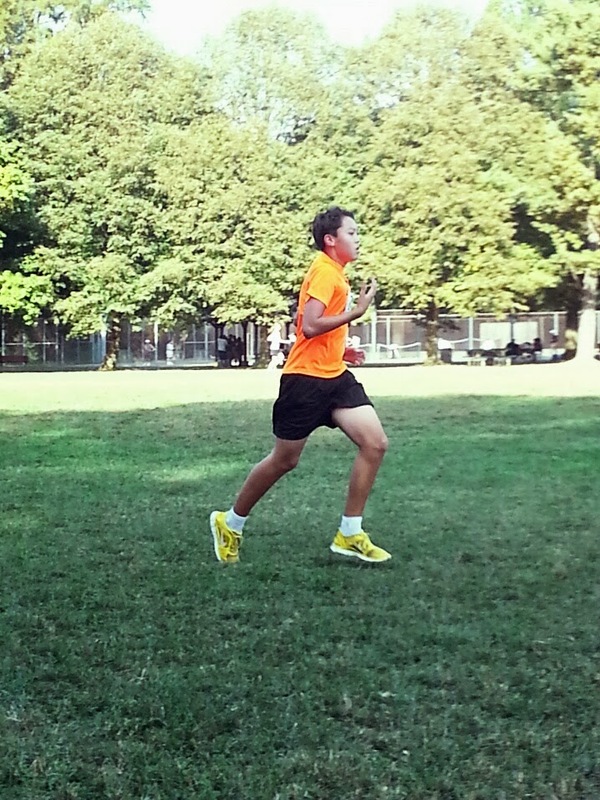 We wont be starting, finishing, or running through that section. Important information about the location and description of the event! Apologies in advance for the length, there’s a lot to cover. Over the past few months, we’ve been making preparations for the event this year through a series of training runs out at Manassas National Battlefield Park on weekends, and collecting information, donations and goods for the Embry Rucker Community Shelter, part of the Cornerstones Foundation. The Embry Rucker Community Shelter is a 70-bed residential shelter providing a healthy, safe, emergency housing for families and single men and women in the Reston, VA area. 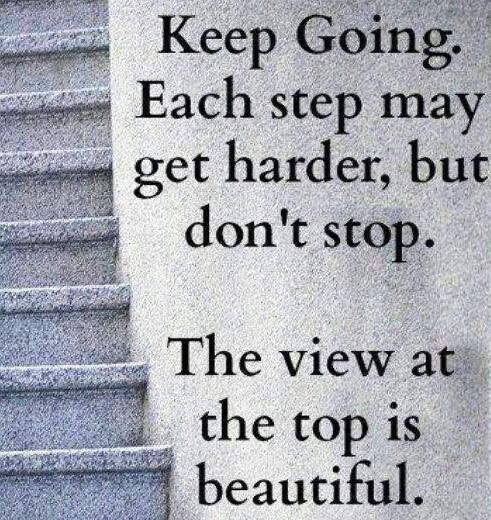 It is operated by Cornerstones, Inc and is open 24 hours a day, 365 days a year. 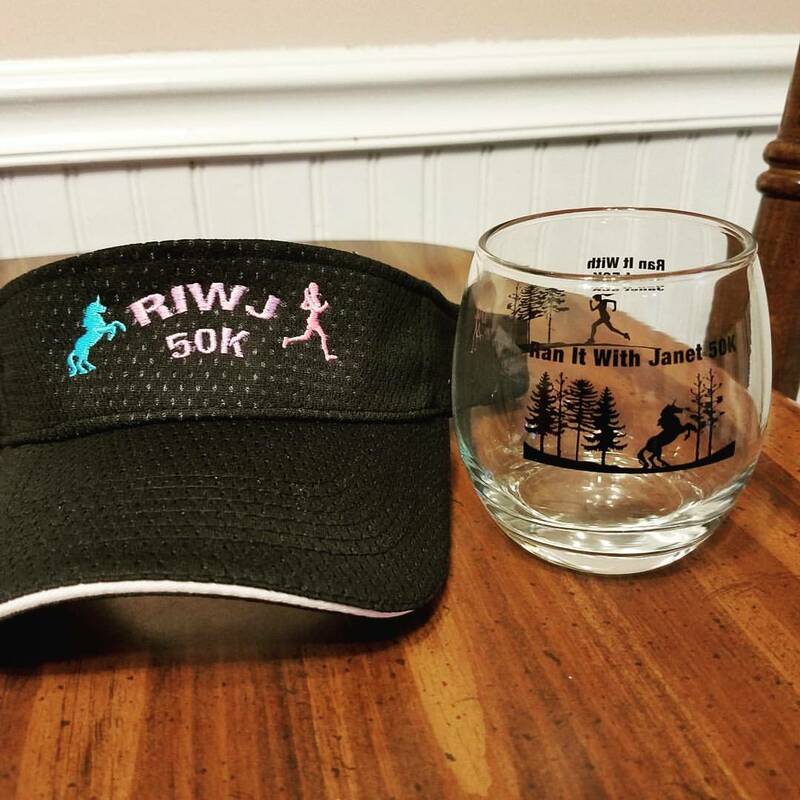 The Ran It With Janet 50K is a fatass event with no entry fees or guarantee of aid stations or awards (we'll probably have some, read on below). We only ask that if you have it within your means, willing and able, that you consider making a donation to the shelter. Some employers match charitable donations so keep that in mind and discuss it with your workplace. 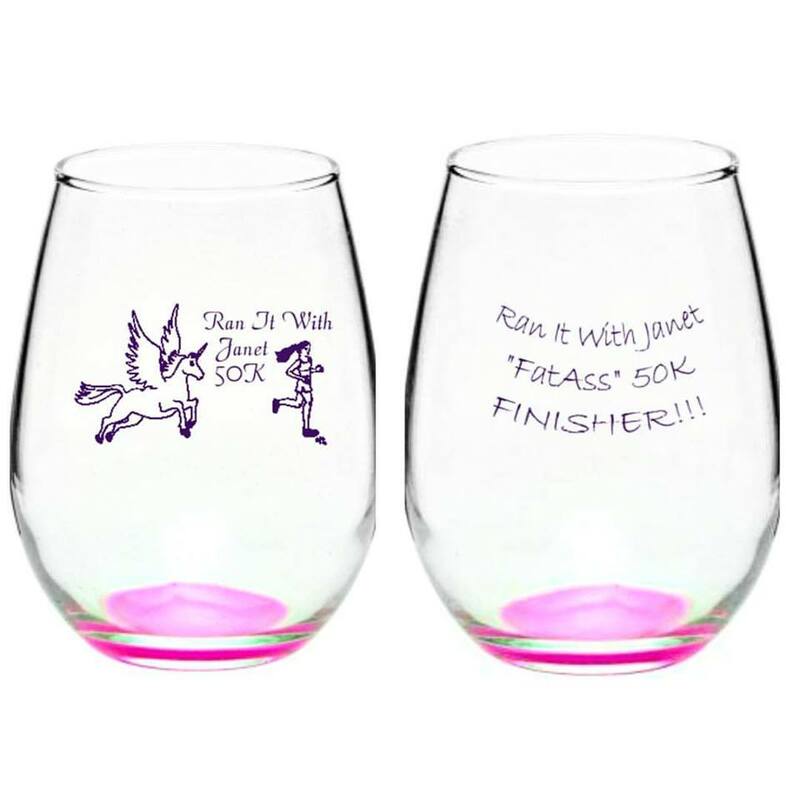 Donations for the shelter or other operations by Cornerstones can be received by Janet Choi before or after the event at the post run party. Please do not count on bringing these items to the park itself. Such activity is prohibited on park lands, and we don’t want to run afoul of the laws and regulations set forth. If you want a receipt for your donation, please be sure to include your name and address so that we can have that sent to you. This year we have a new course to run. We’ve tested it out the past two weekends in both rain and dry sunny conditions. Shown below is the route for the new course. More details will be provided the morning of the event. A limited number of laminated copies of the map will be available at the start/finish. 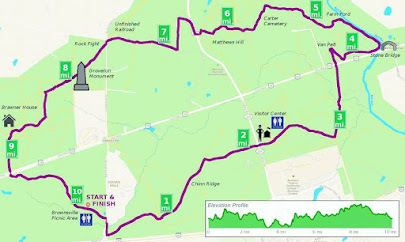 Course Route Description: [M0] From the Brownsville Picnic Area, head east on Wilson Centre Blvd to Groveton Road. Cross Groveton Road safely, and turn right, heading south on Groveton Road against traffic for a short distance up the hill toward Pageland Lane. Turn left at the gated entry to the park, going around gate and running east/north-east towards Second Manassas Trail. 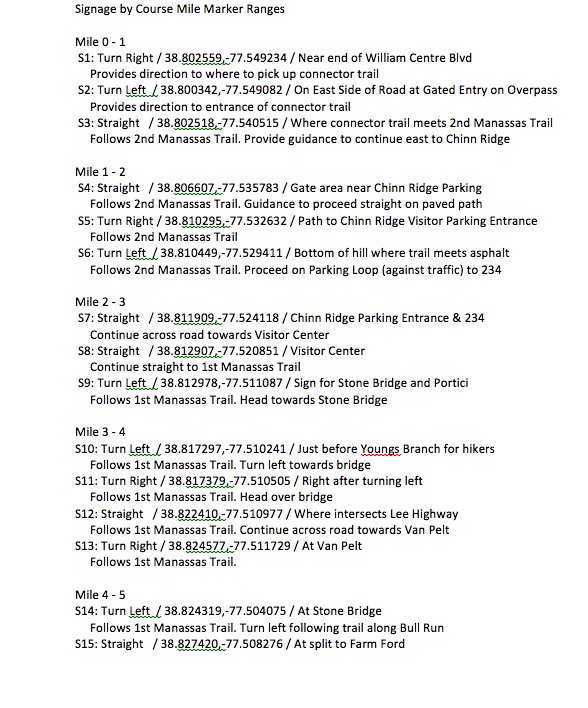 At Second Manassas Trail, follow BLUE markers and go straight across intersections picking up the trail east towards Chinn Ridge. [M1] At Chinn Ridge gate, leave dirt trail continuing on asphalt heading northeast past cannons. In less than a quarter mile turn right onto grassy passage downhill (don't keep going on the asphalt) continuing on Second Manassas Trail to Chinn Ridge Parking area entry road. Turn left onto asphalt at bottom of grassy hill passage running against traffic towards Sudley Road. [M2] Cross Sudley Road safely and up hill to Henry Hill Visitor Center. At top of hill run straight through center of parking lot picking up First Manassas Trail on opposite side. Trail proceeds east into tree line then splits shortly thereafter. Remain right on FIRST Manassas Trail. Proceed southeast about .4 miles. At sign for Stone Bridge and Portici, turn left heading north towards Stone Bridge. [M3] A slight downhill run towards Youngs Branch. Immediately before the river crossing, remain on trail marked with blue dots for hikers, turning left, crossing bridle trail, then right at split to cross foot bridge. 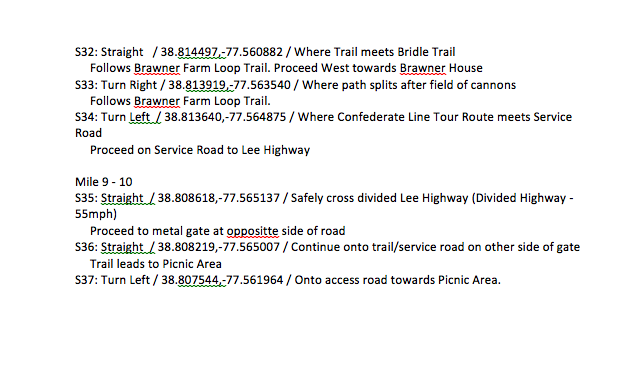 Once you've crossed the bridge,pick up trail and proceed north towards Lee Highway. Cross Lee Highway safely and head up hill towards Van Pelt. At top of hill, at Van Pelt site, do a hairpin turn to the right to stay on course heading south east, past signs for "Shots Fired". Continue downhill to platform walkway. [M4] Proceed east on boarded platform walkway to Stone Bridge. ( Aid Station here) Don't cross Stone Bridge. Remain on trail that follows Bull Run heading northwest. At split, deviate from First Manassas Trail and over Wooden Bridge. Continue uphill to Farm Ford. Proceed on side trail until reaching First Manassas Trail at top of hill. Turn right, heading north on trail. [M5] Stay on trail heading north and west with trees on your right. Cross over bridle trail following blue dot signs. Continue down hill then up past Carter Cemetery. Keep on the trail running through the woods following the blue dot sign posts. [M6] At the Matthews Hill part of the trail, continue straight through all intersections. Once you've cleared the tree line, turn right, heading north towards Matthews Hill parking. At the parking rea, turn left following the trail towards Sudley Road. Transition from First Manassas Trail to Second Manassas Trail. Cross Sudley Road safely and proceed right on the trail heading north. The trail runs the edge of the field near the tree line first north, then west, and finally back south up an incline. At the top of the incline, continue on the trail heading right to the west. [M7] At the fork in the trail, bear right following the blue dot signs to remain on Second Manassas Trail. Continue on trail to Unfinished Railroad Parking. Cross Featherbed lane to pickup trail. Bear left where trail meets road (Straight is a bridle path) heading towards wooden steps. Go up steps, then proceed southwest through tree cover, some wooden bridges to Witness Tree and wooden stairs. Climb wooden stairs and run up hill ridge along Rock Fight Site to Groveton Monument. 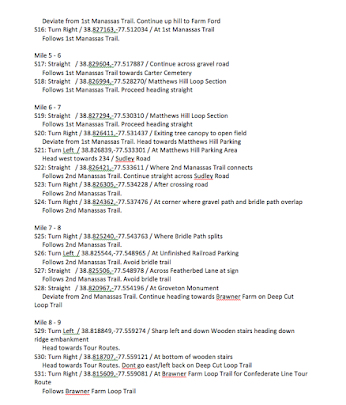 [M8] Continue on Deep Cut trail towards Brawner farm. After a few more wooden platform crossings, you'll reach deja vu steps for what looks like, but isn't, another rock fight site. (This is the Stonewall Brigade site where Colonel William Baylor lead a charge and was rapidly shot down - The "Leroy Jenkins" site). On ridge, proceed toward wooden steps. Take wooden steps down embankment, and follow trail to the right which first goes up a hill. Continue on trail up then down hill passing cannons seen on right until reaching Brawner Farm Loop Trail at the tree line. Turn right heading west on loop trail (Confederate Line Tour Route). After some light bushwhacking, this is one part of the course that may be a bit muddy. Cross wooden bridge and come out of trees. At intersection with bridle path, continue straight across and up hill. Continue straight across next intersection heading southwest. View a line of cannons on your right in open field and fencing on left. Bear right continuing on tour route through tree line. Continue on curved route bearing slightly to the south until meeting trail just before Brawner Farmhouse. Continue on trail towards service road, passing the Union Line Tour Route on your left. [M9] Continue south on service road towards Lee Highway. Just before Lee Highway, go around gate. Safely cross Lee Highway (divided road @ 55mph) to park access gate on south side. Go around gate and stay on trail. Restrooms: There are two locations on the course that offer restrooms. First, at the Brownsville Picnic Area serving as the start/finish of each loop. You’ll be able to use this anytime throughout the day. The other restroom location along the course is at the Henry Hill Visitor Center, which opens around 8:30AM. As such, it won’t be available on the first loop but will be for the other circuits. Aid Stations: We will have some water and basic aid available at various locations. 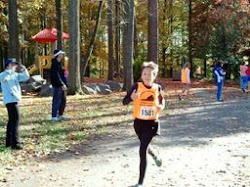 All runners are strongly encouraged to bring hydration and fuel that you would normally use for long runs such as this. The start/finish area (mile 0/10.3) at Brownsville Picnic Area will have water, lemonade, mountain dew, chips. 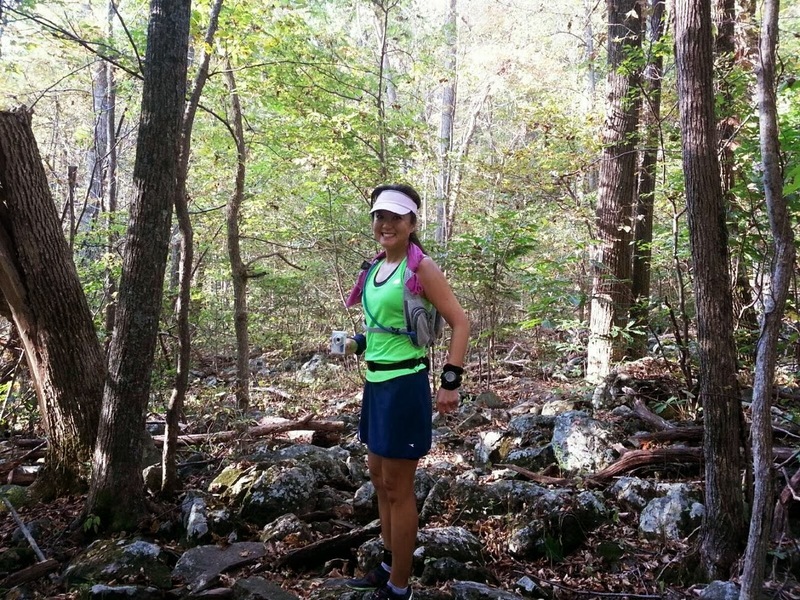 Stone Bridge (around mile 4.5) will offer water and possibly chips or other salty goods. The Unfinished Railroad parking area (mile 7.5) will have water, lemonade and possibly chips and other light fare. There is also a water fountain available inside the Henry Hill Visitor Center located around mile 2.4. It is possible that water jugs may be made available at Matthews Hill Parking (mile6.5) and the picnic table after crossing Young's Branch around mile 3 before the crossing at Lee Highway. Course Conditions: Several of the training runs we've held out at the Battlefield have been during the rain drenched period. 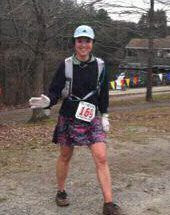 I'm happy to report that this past Saturday's training run on the 28th revealed that much of the course had dried out. While we're anticipating some rain this week, there's a good chance that the sun will be shining on Saturday. There's also a good chance it'll be an overcast day, possible rain and small chance of thunder. In any event, we strongly encourage liberally applying sunscreen, particularly approaching areas where there are long periods of direct sun exposure. 16% believe they'll be finished in under 6 hours (avg 11:37/mile). 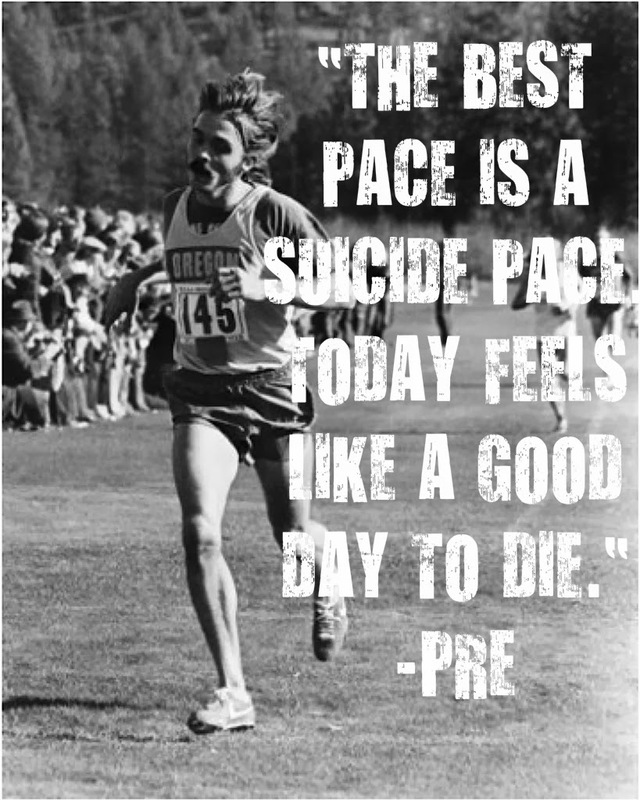 Starting Time: This year, we will start the run at 6:30 AM from the Brownsville Picnic Area in front of the pavilion. 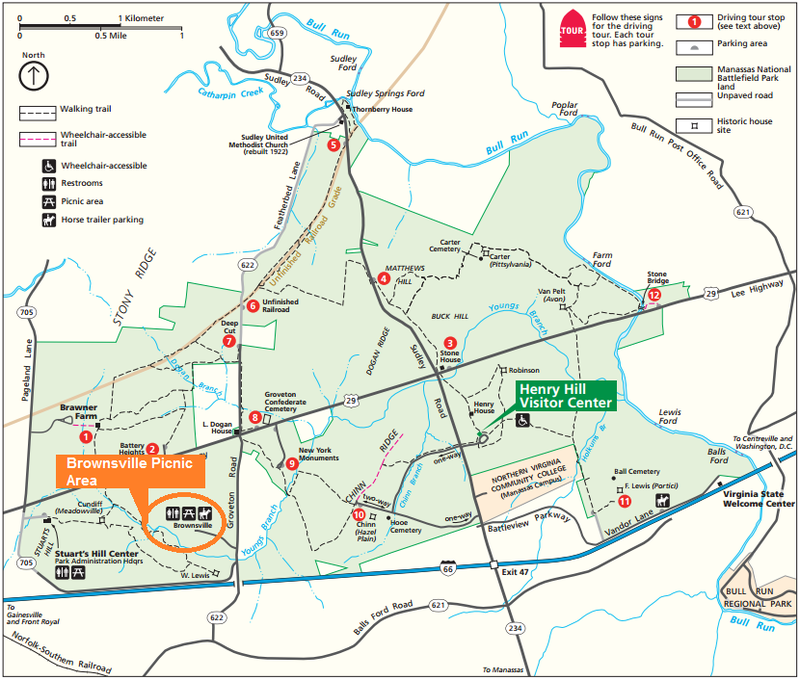 To get to the Brownsville Picnic Area in Manassas National Battlefield Park, the easiest route of travel is by taking exit 47B from Interstate 66 heading north on Sudley Road. You’ll pass the Community College and then the Visitor Center entrance to the park. Keep traveling north until you reach the stop light at Lee Highway. You’ll see the Stone House at that intersection. Turn left heading west on Lee Highway and travel about a mile to the next intersection (there is no light). On the right is Featherbed Lane. To the left is Groveton Road. Take the left heading back south on Groveton Road. The entrance to the picnic area will be less than a mile on the right. Immediately before it you’ll see a sign for Horse Area. If you get to Pageland Lane, you’ve gone too far! It’s a big entrance but will be easy to go past if you’re speeding. Don’t do that! Our permit submission has been reviewed and is tentatively approved. The permit allows us to have larger groups like this and put up temporary signage. This year we decided to make up some bibs for people to wear at their discretion. Think of it like a special numbered name tag so you can know who everyone else is. But it's so much more than that. These bibs are more then just a "Hello My Name Is" tag. They also have a Unicorn on them making the wearers run faster. The bib can serve as a memento of the event, and will hold up against the sun, rain, snow, mud, and/or sleet that may be occurring that day. Previous emails were sent with your bib number if you were signed up by May 23. Don't worry, if you have signed up and receiving this email, there is a bib with your name on it. And we have a few available to write-in for those showing up at the last minute. If you have any questions, comments or concerns, please send them to us and we’ll address them as promptly as we’re able. So far its looking to be a successful fun run thanks to everyone who plans to be there and the volunteers who are helping to put this on.